The CM-1 mainsail for the J/105 is designed for easy tuning and trimming. Built from Polykote 7.52 oz. AP, the best 7.5 oz yarn-tempered Dacron available, this mainsail performs well over a wide range of wind conditions. 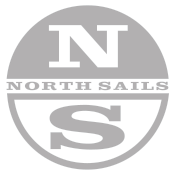 This is the sail of choice for boats that sail primarily in under 18 knots. The A2-2 is our latest development for the J/105 class. It has proven extremely fast in all conditions. The powerful sail projects to windward, allowing you to sail deeper angles than before with similar speed. It's a true weapon in windward/leeward course racing. Made out of AirX 700 spinnaker cloth. The A2.5-1 is based off our new A2-2 design, but with added reinforcement in the patching giving it increased durability. The J/105 Class rules allow for two spinnakers to be carried onboard while racing. The A2.5-1 is a great addition to your inventory. Made out of AirX 700 spinnaker cloth.